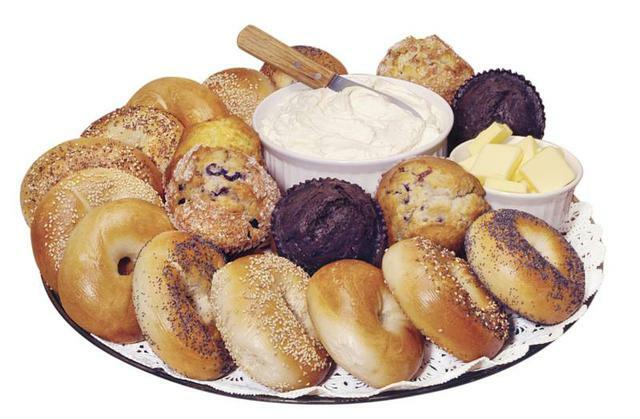 Authentic New York style bagels with more than 10 varieties for you to enjoy. Store-made, gourmet cream cheeses made with fresh ingredients and no preservatives are available for take-out or we'll spread your bagel for you. Whether you are having a classic breakfast sandwich hot off the grill, hearty lunch sandwich or a simple cream cheese bagel and a cup of coffee, we make your selection to order just the way you like it any time of day! Experience the legendary taste, attentive service, and friendly atmosphere and see why you'll come back time and again just to try something new! Sit down and enjoy a plate of eggs or awesome pancakes! ASK ABOUT BAGEL, SWEETS AND SANDWICH TRAYS!!! We deliver them too! MyPaintCafe Class info on last page!